One level, four bedroom home in great neighborhood with almost 2400 sq. ft. of living! Formal entry leads you into the spacious open living space with high ceilings, wood floors and fireplace. 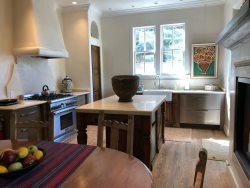 The large kitchen has stainless steel appliances, breakfast area as well as a separate, formal dining room. At one end of the house is the guest wing with three bedrooms and Jack and Jill bathroom as well as powder room. The master suite is privately ensconced in the back corner of the home with a luxurious bathroom with tub, shower and huge walk in closet as well as access to the patio area. The amenities and touches throughout the home include ceiling fans, vigas, two swamp coolers, security system and a walled in yard with portal, basketball court and oversized two car garage. The Owners will consider a well behaved dog. $2600 per month plus utilities. Security deposit of $2,500 plus a pet deposit is required.